Antique Bronze is a patina (blue liquid) that instantly imparts a light to dark bronze finish on steel & iron. Antique Bronze is used for lighting fixtures, railings, hardware, gates, gift items, basically anywhere steel or iron need to be given a Antique Bronze Look. The parts should be cleaned and conditioned with Surclean-400 by dipping your pieces, and depending how dirty they are you can scrub with steel wool. (If Surclean-400 is not an option you can sandblast your pieces). 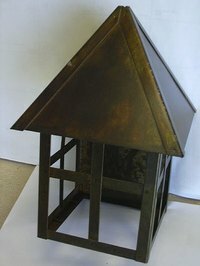 Antique Bronze can be sprayed or brushed on steel/iron. For brushing use as is, brush back and fourth a few times and wait for 1-3 minutes. For spraying, dilute 1:2 with water, dip for 5-30 seconds (depending how light or dark brown you desire. )Rinse with water & dry with rag right away. Protect your finish with a Lacquer/Sealer. I recommend Acrylaq-1045 flat lacquer for exterior and interior. Use as is and spray evenly. If you would like to achieve this finish you can contact me claudiasurfin@live.com,or go to www.surfinchemical.com. A sample kit is offered on over 100 patinas.